A full time Nanny, either live in or live out, generally works more than 25+ hours per week. A part time Nanny works no more than 24 hours per week. A temporary Nanny works a minimum of 4 hours and can work up to 50 days. 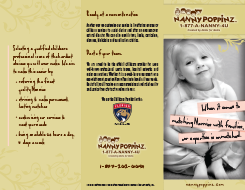 Corporate, Convention or Special Event Nannies are normally for the duration of the event and are costed at or as near to cost to Nanny Poppinz as is possible. Newborn Infant Specialists are more expensive.